A Russian MIG-31K interceptor test fired a Kh-47M2 Kinzhal (“Dagger”) air-launched ballistis missile (ALBM) during a recent joint exercise with a Tu-22M3 long-range strategic and maritime strike bomber, according to a video posted by Russia’s Ministry of Defense (MoD) on a social media site on July 19. 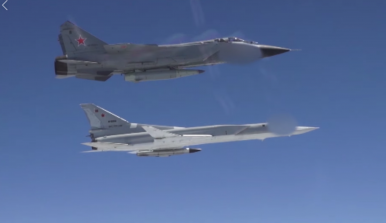 The video shows the MIG-31K, a modified MIG-31BM, flying in formation with a Tu-22M3 bomber, releasing the Kh-47M2 missile in flight, which is followed by video footage showing the missile’s ignition and flight. The video does not show the resulting strike. The Russian MoD last released video footage of a Kh-47M2 test launch on March 12. Earlier that month, Russian President Vladimir Putin officially revealed the ALBM as one of six new hypersonic weapons that purportedly would enter into service with the Russian military in the near future. The nuclear capable Kh-47M2 ALBM is thought to be a variant of the ground-launched Iskander-M short-range ballistic missile. The Iskander, reportedly capable of reaching speeds of up Mach 5.9 in its terminal phase, is thought to have a range of about 500 kilometers. All these claims are highly questionable, as a number of analysts have pointed out in the past. The Russian MoD video also shows a Tu-22M3 carrying what appears to be a KH-32 nuclear-capable cruise missile , an upgraded variant of the Raguda Kh-22 long-range anti-ship missile, which has been specifically designed to attack U.S. Navy carrier strike groups, but it also capable of striking land targets. The Kh-32 is thought to have entered service with the Russian military earlier this year. Russia is currently in the process of upgrading its Tu-22M3 fleet. The first upgraded variant, designated Tu-22M3M, is expected to take to the skies for the first time in August. Overall, the Russian Air Force currently operates around sixty Tu-22M3M. The serviceability rate of these aircraft is estimated to be below 50 percent. The Russian MoD intends to modernize around 30 Tu-22M3.